Tres años después de la última vez que fuimos juntos de excursión por Nueva Zelanda volvimos a encontrarnos con nuestro buen amigo Pol, que después de su aventura kiwi regresó a Catalunya donde sigue esquiando todas las montañas esquiables de los Pirineos en invierno y haciendo trail running en verano. Pol parece haber encontrado un balance perfecto entre trabajo y ocio de aventura: es como Batman, durante el día es el encargado de Social Media de la empresa Royal Queen Seeds y en su tiempo libre prueba material técnico de montaña mientras sube y baja picos de los Pirineos para luego escribir valoraciones en revistas especializadas como Trail Running Review, Corredor de Montaña o la australiana Ultra 168. Quedamos con Pol y Drea, la perrita que hace años adoptaron en Caldes Animal, para subir a una de las cimas míticas de Catalunya y la montaña más alta del macizo del Montseny: El Turó de l’Home, de 1706 m.
Nos encontramos en la estación de tren de Granollers y desde allí fuimos en coche hasta el pueblo del Montseny, desde donde empezamos la caminata. 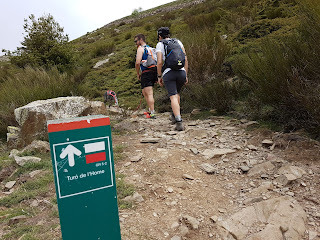 Seguimos la ruta marcada por las clásicas franjas blancas y rojas de Gran Recorrido, en este caso parte del GR5. Empezamos cruzando bosques con masías desperdigadas por senderos llenos de ortigas y zarzas, lo que fue una pequeña tortura ya que todos íbamos en pantalón corto. Pasada la media hora empezamos a ascender siguiendo la pista forestal de los bomberos desde la que pudimos ver los efectos de las grandes nevadas de este invierno pasado. Toda la vegetación estaba aplastada debido a los aludes. Pol nos estuvo explicando que este invierno había gente que bajaba el Turó de l’Home esquiando. Una vez salimos del bosque empezó el ascenso de verdad, el de pendiente pronunciada y rocas grandes. Llegamos hasta el Turó de l’Home a la vez que las nubes y el viento así que nos hicimos las fotos de rigor y nos fuimos a comer el bocadillo a una zona algo más resguardada. 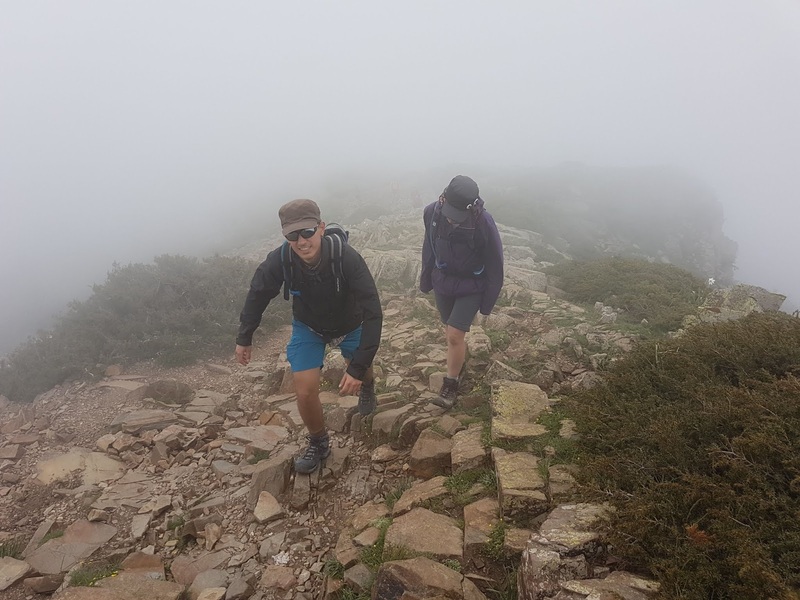 Ahí en la cima, al lado de la estación meteorológica que hizo famoso al Turó, coincidimos con los participantes de la 43 edición de la marcha excursionista de resistencia Travessa del Montseny, 48 km de recorrido en los que se enlazan las cimas del macizo desde Aiguafreda hasta Gualba. Un buen tute. Al acabar los bocadillos, rápido porque comer con Drea mirándonos y conspirando para robarnos el pan era muy inquietante, decidimos llegar hasta la cima de Les Agudes que estaba bien cerca. Tuvimos niebla así que vimos poco el paisaje pero la zona estaba muy bien. Durante el camino de vuelta las nubes desaparecieron y tuvimos un buen sol que nos acompañó hasta que entramos en el bosque. Three years after our last hike in New Zealand, we managed to meet again with our good friend Pol. 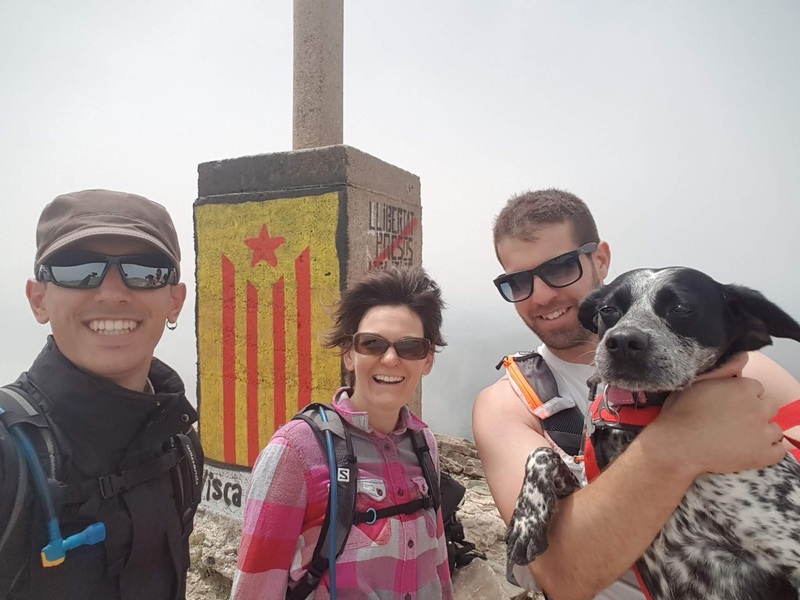 After his own Kiwi adventure, Pol went back to Catalonia where he keeps skiing all the snow-covered mountains during the winter and runs over all possible mountain ranges in the summer. Pol seems to have found the perfect balance between his professional career and his personal life. 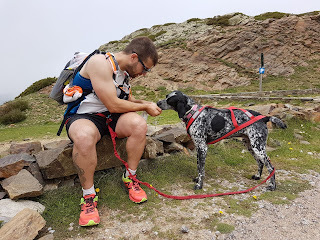 He’s a real life batman: during the day he is the Social Media Manager at Royal Queen Seeds and after work he tests gear in the mountains, climbs peaks in the Pyrenees and runs down to write reviews in technical magazines such Trail Running Review, Corredor de Montaña and the Australian Ultra 168. Our plan was to go with Pol and Drea, the girl-dog that his family adopted at Caldes Animal years ago, to climb one of the classic peaks of Catalunya and the highest hill in the Montseny Massif called El Turó de l’Home. The name literally translates for The Man’s Hill and it’s 1760 m high. We met in Granollers Centre train station where Pol picked us up and drove to the village of Montseny where the track starts. The trail is marked as it’s part of a Great Route: the GR 5 which draws a half circle from coast to coast crossing the interior of Catalonia starting in Sitges and ending in Canet de mar and going through el Montseny Natural Park and Montserrat. This last one is probably the most iconic range in Catalonia. The day started crossing the forest and walking on narrow trails covered with stinging nettles and blackberry bushes to scratch our bare legs and wild rosemary, thyme and lavender on the side to make us forget about the pain. A few old farm houses scattered the first few kilometres of the route and the more we climbed the less walls those houses had. Soon after the start, the track follows a forest road recently built. From there we could see the effect of last winter’s large snowfall. There were many patches of fallen threes caused by avalanches on the hillside of the massif. It seems that the good snow has been ubiquitous in the whole Northern Hemisphere and this year the locals have been able to climb and ski down this hill which doesn’t happen every year. After leaving the forest the real climb starts, the slope is way steeper and the ground a bit more rocky. 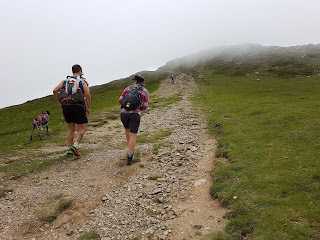 We reached the top at the same time as the clouds and the wind did. Then, we decided to find a sheltered spot to have lunch after taking some pictures at the top. There’s a triangulation point and a weather station in the summit that gave this mountain a great deal of popularity among the mountaineering scene during the past century. 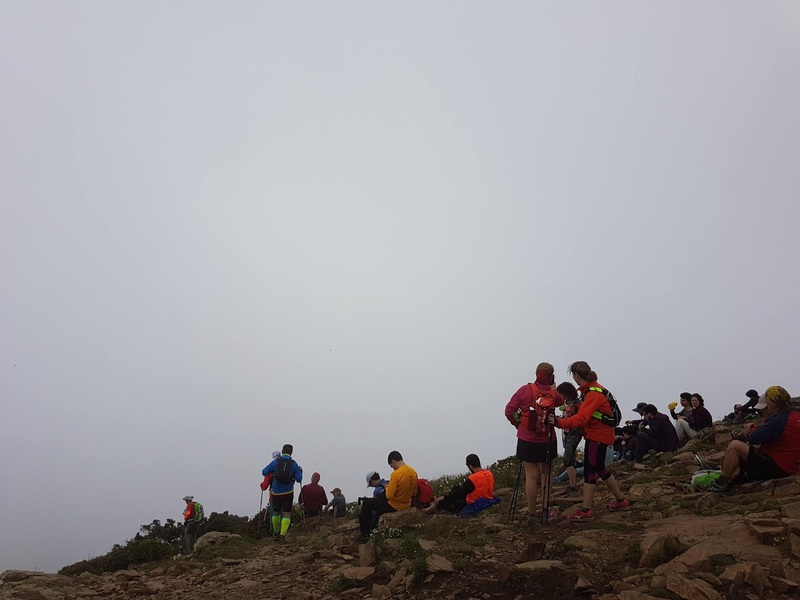 At the top, we could cheer for the participants of the 43rd Travessa del Montseny. 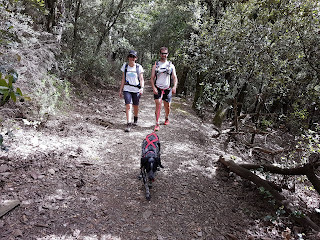 That is a 48 km long endurance hike that takes people from Aiguafreda to Gualba. Nothing to joke about. 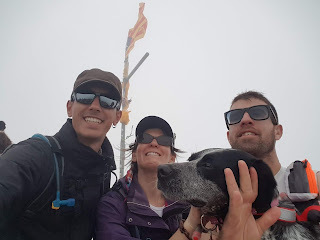 After eating our lunch pretty fast (Drea would take care of them if we got distracted), we visited the other peak of Les Agudes. Both peaks are very close to each other. Unfortunately the fog completely blocked the view but the trail was nice and we meet many participants of the popular hike. On the way down the clouds cleared and the sun came out and tanned or burned our skins until we made it back to the forest.